If you like to combine shopping with your winter sunshine vacations then Sarasota County's eclectic shopping won't disappoint. From designer clothing, art galleries and antiques to flea markets and outlet malls, Sarasota is the perfect one-stop shopping destination. Downtown Sarasota offers small-town Americana on Main Street, while the art galleries on Palm Avenue remind you of New York and L.A.
At Towles Court in downtown Sarasota, you cannot only purchase original artwork, you can see the artists working on their pieces. This artist-in-residence community is situated in a collection of pastel-colored homes in a backdrop of shade trees. Every third Friday of the month, artist lovers can meet the artists, stroll through the square and experience "Art by the Light of the Moon," a moonlit display of masterpieces. If antiques are your fancy, you can't miss Herald Square, in downtown Sarasota. This treasure trove is rich with one-of-a-kind antiques that even the most skilled antique shopper will appreciate. The quaint storefronts and diverse selections make Herald Square an ideal antiquing spot. Just a little further south in Sarasota County is another quaint downtown shopping area called Venice Main Street, in downtown Venice. 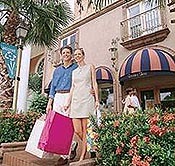 Boutique-style shops, outdoor caf�s and specialty stores are neatly wrapped in attractive Italian Renaissance architecture and fragrant Florida foliage. For the politically correct shopper, Artisan's World Marketplace carries a variety of unique artifacts from artists in developing countries all over the world. The Artisan's World Marketplace pays artists the fair market value for their wares and provides funding for projects that create jobs or provide job training for low income or disadvantaged persons. The fine shops in St. Armands Circle are filled with stylish items for the upscale shopper. Chico's, Tommy Bahama, The White House/Black Market and Joli's of St. Armands are just a few of the fashion shops to choose from. If you're looking for jewelry, Optional Art, McCarver & Moser, Alexander Fine Jewelry and Armel Jewelers will dazzle you. St. Armands' novelty shops will tempt you with their clever, specialized inventory. Visit The Mole Hole, Ted E. Bear Shoppe, The Alphabet Shop and Wet Noses, a store for pets and people who love them. And, while you're there, stop for dinner at the Columbia Restaurant, Crab and Fin or Hemingway's and have some homemade ice cream at Kilwin's. Westfield Shoppingtown Southgate is an upscale, traditional-style mall with fine retailers such as Ann Taylor, Talbots, Express, Express Men, Pottery Barn and Banana Republic. Shop for apparel, home furnishings, shoes, jewelry and more at Saks Fifth Avenue, Dillard's and Burdines and a gift for that special someone in Ashley Avery's Collectibles. American Eagle, Gap, Pacific Sunwear, Limited Too, and Express are just a few of the fashion stores to choose from in Westfield Shoppingtown Sarasota jungle of retailers. The Disney Store, Things Remembered and Spencer Gifts are some of the 19 specialty shops you'll find. And once you're finished with your shopping safari, refuel in the food court. Outlet shopping at Prime Outlets in Ellenton is just a short drive north on I-75 with over 100 stores to choose from. Ralph Lauren, Gap, Geoffrey Bean, Tommy Hilfiger, Nike, Banana Republic, and Off Fifth are just a few of the wallet-luring outlet shops you'll find there. For all of the bargain hounds out there, the Red Barn Flea Market Plaza will keep you hopping. The Red Barn houses more than 400 covered booths for inside shopping and 200 outside booths for extra variety. Parking and admission are free and there are courtesy carts to take you to the market from the parking lot. For more information on Sarasota shopping, contact the Sarasota Convention and Visitors Bureau at (941) 957-1877 or (800) 522-9799.